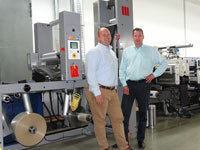 Uwe Refflinghaus (left) and Matthias Walter with the Martin Automatic MBSC unwind/splicer that is fitted to the company's Gallus ECS 340 flexo press. When German label converter GEWA installed Martin Automatic technology in 2011, it was to reduce the quantity of waste material and save on energy costs - five years later the company has installed more Martin equipment for a different reason. Nick Coombes reports from Bingen-am-Rhein. GEWA specialises in printing and converting labels for the German wine industry, and a visit to the company's headquarters in Bingen, surrounded by vineyards, gives a clear pointer as to how and why the business, now under third generation management, has developed. When brothers Heinrich and Franz Walter established the company in 1931 it was to produce general commercial print, but by the 1970s it had become obvious to sons Heinz and Kurt Walter that the wine and spirits trade offered significant business opportunities. 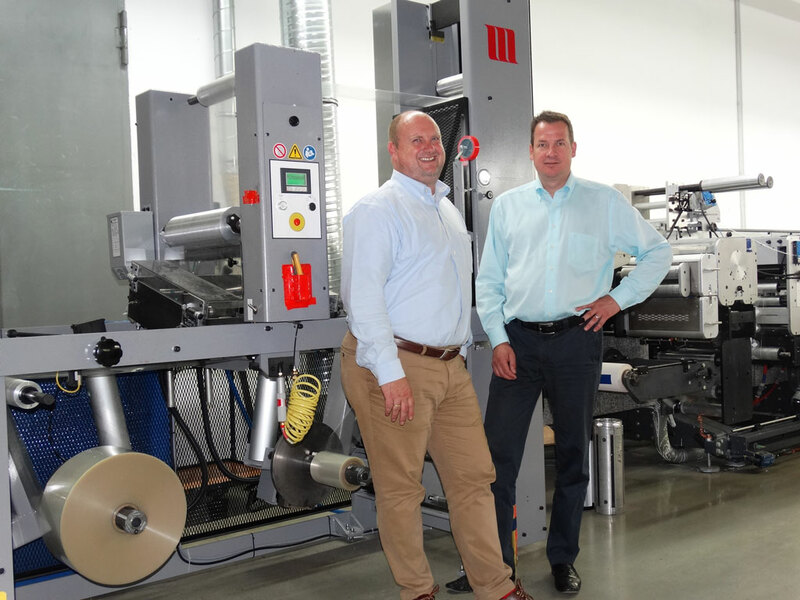 Today, Matthias Walter heads up the company, which comprises sheet-fed offset, and rotary inline offset and flexo presses on separate sites, employs 180 staff and generates sales of more than €23m per year. The need for printing wine labels in volume is highlighted by Walter: "Two thirds of all the wine consumed in Germany is imported in bulk and then bottled. It is a very price-sensitive market, with the average price per bottle purchased being less than €3 - so efficiency and cost effective production is absolutely essential." Although the larger proportion (60%) of GEWA's labels are still produced on a bank of Heidelberg, Roland and Ryobi sheet fed offset presses, that figure is reversed as a sales value calculation, with rotary flexo production currently contributing 65% and growing. Production is carried out on suite of Gallus, offset, flexo, screen, and combination lines, with the most recent being an ECS 340 with full UV curing capability. Back in 2011, GEWA invested in Martin Automatic MBSC unwind/splice and STR rewind technology for its Gallus RCS 330 and EM 340 presses largely because the local authority was offering financial incentives to companies who could demonstrate a reduction in power consumption. In addition to achieving a 23% reduction on its energy bills the Martin technology also highlighted the savings that could be made by reducing waste. Matthias Walter explained: "Reducing waste and cost is our mantra at GEWA, so the savings that the Martin equipment offered on the first two presses made it logical to fit the same equipment to the third, and with a payback (ROI) of less than two years on the high-cost substrates we run here, the MBSC and STR more than justify themselves." According to GEWA, some of the benefits of Martin non-stop roll handling automation are less obvious, but equally as valuable. Uwe Refflinghaus, Production Director, explained: "The money we save by using all of the substrate on every roll is clearly calculable - what is not so obvious is the benefit of non-stop running in terms of sustained print quality on jobs, and the production time that automated roll changing adds to each shift. Apart from improving the bottom line, this facility gives the press operator a sense of security, and allows us to do sampling without stopping the press. Lose waste and win time - it's the easy explanation!" Although the Gallus RCS is the fastest of the offset/flexo presses at GEWA, it is the one on which most of the complex jobs are handled using its screen and embossing capabilities, so the more recently installed ECS, which regularly runs with cold foil at average speeds of 90m/min, really benefits from the automation offered by the Martin equipment. A nine-colour full UV press, the ECS 340 typically handles jobs of 5000 linear metres, though GEWA estimates the average across all three flexo lines is around half that, at 2500 - 3000. With these short runs, the company estimates each press requires 4000 roll changes per year. This would be lost production time with the presses stopped for manual changes, but is gained time with the Martins enabling the press to continue running at full production speed. "We have no minimum or maximum run lengths here, but generally 500 - 80,000 metres would cover most of our work. Obviously, the shorter runs pose the biggest challenge as far as reducing time and material waste, and this is where automation offers a clear advantage. The splicer enables us to use up residual or partial rolls, and prepare the next substrate roll, so we can keep the press running. Since we began our efficiency programme, we have reduced waste by over 60% across both plants and the Martin Automatic machines have played a significant part in this," commented Walter. With a discerning and demanding customer portfolio to service, which numbers more than 2500 companies, GEWA is proud of its quality record. Accredited for ISO 14001 and 12647, as well as holding the FSC badge, the company is self sufficient for pre-press with the latest Esko and Adobe software. More than 70% of all of Germany's wine producers are located within a radius of 60km from GEWA. "When you are using high-cost materials, as we are here, knowing your output per hour in money terms is vital. You can only do this if you have full control of production because cost effectiveness only comes with efficiency - and that's how we decide on our investment programmes," added Refflinghaus. Bernd Schopferer, Martin Automatic's European Sales Manager commented that from his company's point of view, the most telling statement from GEWA was simply this: 'It's not only the cost of waste we save - it's the value of extra sales we make that justified fitting Martin non-stop automation to our new label press.' He quipped: "You know, I think that would make a very useful yardstick for other label converters to measure their own performance!" In today's package printing market, which is highly competitive, automation is the answer to many of the questions being posed.